In a highly unusual case, a California family law attorney was recently arrested for conspiracy to place listening devices in the vehicles of her clients’ estranged spouses. 60-year-old Mary Alice Nolan of San Ramon is accused of using information obtained through automobile bugs to gain information that could benefit her clients in divorce proceedings. According to the United States Attorney’s Office, Nolan was indicted by a grand jury on September 6th for unlawful conspiracy to intercept communications, unlawfully intercepting communications, and evading taxes. An investigation conducted by the Federal Bureau of Investigation and the Internal Revenue Service reportedly found that Nolan hired a private investigator, Christopher Butler, to unlawfully intercept the verbal, electronic, and wire communications of her clients’ estranged spouses in 2007. Prosecutors allege that Nolan personally monitored the conversations of her clients’ former spouses using listening devices installed by Butler. Nolan then reportedly used the information she obtained against the men in family court proceedings. Butler allegedly admitted to secretly recording conversations on behalf of attorneys up to 100 times. Nolan was also accused of orchestrating drunken-driving arrests for men in the midst of divorce. According to Butler, he hired attractive women to entice the estranged spouses to drink alcohol and then drive. Butler stated he would call police to report the men who succumbed to his plan once they drove away. The driving under the influence (DUI) arrests were allegedly designed to be used against the men in future child-custody hearings. Contra Costa prosecutors stated at least five men were arrested for DUI as a result of Butler’s surveillance. The former spouses of two of the men were reportedly represented by Nolan. If convicted, Nolan faces up to 15 years in prison and a $750,000 fine. This case highlights the unnecessary and extreme measures some people will go to in order to gain the upper hand in a divorce proceeding. A good attorney, however, will explain your rights, help you protect your financial interests, and discuss what to expect in a typical divorce. While each situation is unique, California law normally seeks to divide both property and debts equally. Although the law for a California divorce can seem complicated, it is important for divorcing individuals to have realistic expectations, be willing to compromise, and be properly prepared. Because going through a divorce can be a stressful and emotional time, selecting the right Southern California family law attorney is vital. If you are considering ending your marriage, you should call Doppelt and Forney, APLC toll-free at (800) ROY IS IT (769-4748). 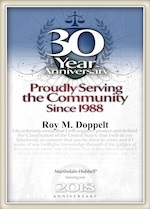 Mr. Doppelt is a skilled Linda Vista divorce lawyer with more than 20 years of experience guiding clients through the legal separation and divorce process in the State of California. Mr. Doppelt is here to help you with your alimony, adoption, premarital agreement, divorce, child custody, child support, and other family law needs. Doppelt and Forney, APLC represents clients in Scripps Ranch, Linda Vista, San Diego, Encinitas, and throughout Southern California. To schedule a free confidential consultation with an experienced family law attorney, please contact Doppelt and Forney, APLC through the law firm’s website.